As previously reported, new surrogacy dads are now wanted for an unprecedented study of new parents in the UK, France, and the Netherlands. The 3 year study will focus on male couples who became parents through surrogacy, compared with groups made of heterosexual surrogacy parents and lesbian headed families who were aided by donor insemination. The researchers leading these studies include distinguished professors such as Michael Lamb (University of Cambridge), Henny Boss (University of Amsterdam), Martine Gross (Centre Nationale de la Recherche Scientifique), and Oliver Vecho (University of Paris). The study is a collaboration between Cambridge University, University of Paris, and the University of Amsterdam, and it is funded by Open Research Area in Europe for the Social Sciences (ORA). 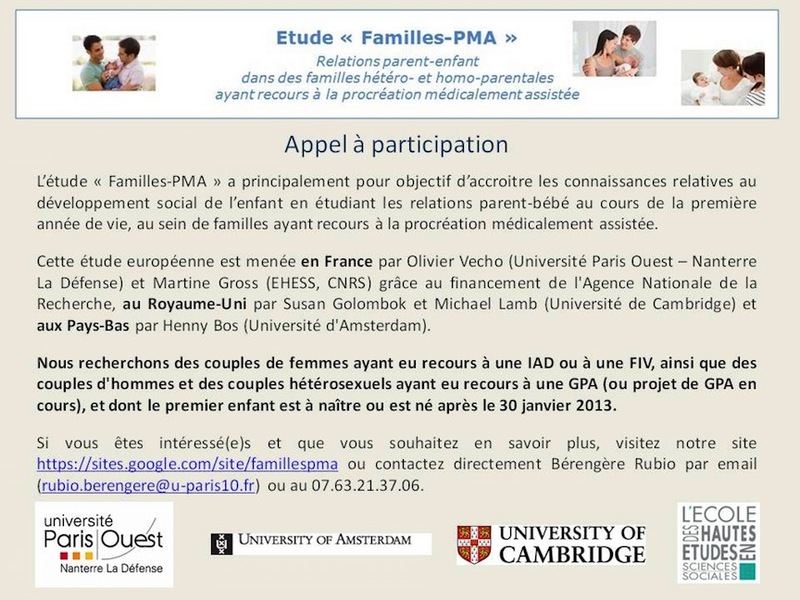 Some of these researchers have already taken part in well known LGBT parenting related research (including the US National Longitudinal Lesbian Family Study with Nanette Gartrell), and we all hope that this study will break new ground by investigating emerging family forms created by this form of assisted reproduction. When a baby joins their parents for the first time, a family is created. This exciting time is a great time to learn more about how children and families develop. We are a team of researchers from the University of Cambridge, UK; The University of Paris, France; and The University of Amsterdam, the Netherlands, who are interested in the journeys new families take during the baby’s first year of life. Understanding the journeys different families take in the first year of infancy is important because this knowledge can allow us to better guide and inform new parents and ensure that they get the support they need. The New Parents Study is a study that aims to extend our understanding of early social development by tracking the formation of relationships during the first year of the baby’s life. In the New Parents Study we are specifically interested in hearing from any parents based in the UK, France or the Netherlands, whose family formation has been aided by donor insemination or surrogacy. We are interested in studying lesbian, gay and heterosexual couples and their new infants. During the New Parents Study we will be visiting families in their homes when the baby is 4 months old, as well as inviting families to come and see us when the baby turns 12 months old. We aim to make the visits fun and interesting while extending our understanding of families in the baby’s first year.